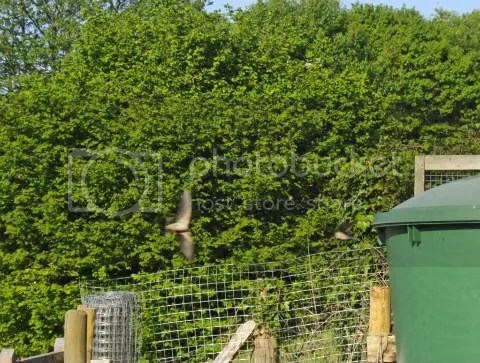 When we bought La Fosse in the summer of 2000, we had resident barn owls in the east gable chimney and swallow nests in the roof space upstairs. One of the downsides of renovating was that the disturbance and re-roofing of the building sent the barn owls off to calmer roosts. 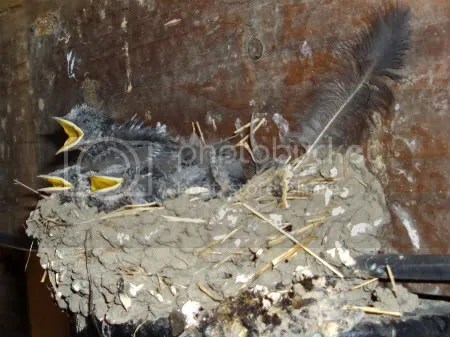 The swallows still take advantage of open bedroom windows to fly in and around checking for suitable beams on which to build a nest but they usually fly out again without stopping. Or, fortunately, without leaving us a deposit. It’s curious that they are so interested in the top floor. I am guessing that none of the swallows visiting us now were born or have nested here pre-renovation. So where is the desire to use the upstairs of this building coming from? Is there something that directs them to use a specific place that parents or grand-parents used? Some embedded bird-brain satnav coordinates that guide them in? Or is it just that the building looks right and hey guys, there’s a big opening we can fly through. 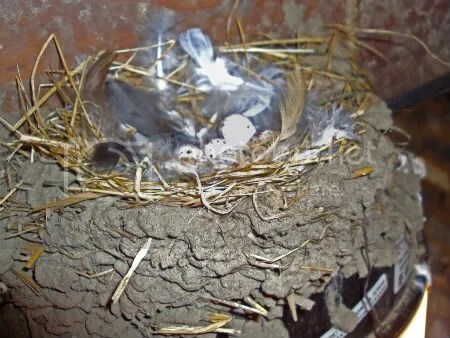 Because swallows must be able to fly into their nest location – they won’t perch on a brick and hop through a hole, say. 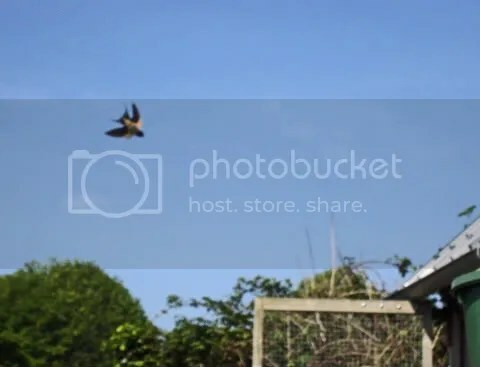 Apparently the average lifespan of a swallow is 2 years (though the oldest recorded swallow is 11 years) so realistically there are unlikely to be any 6+ year old swallows looking to repeat their honeymoon summer. (Survival info is from the BTO website, link at the bottom of this post). We have one small outbuilding which we use as a shed for the sheep in bad weather and also to house ewes and lambs until we judge the lambs are big enough not to make a crunchy woolly snack for a passing fox. 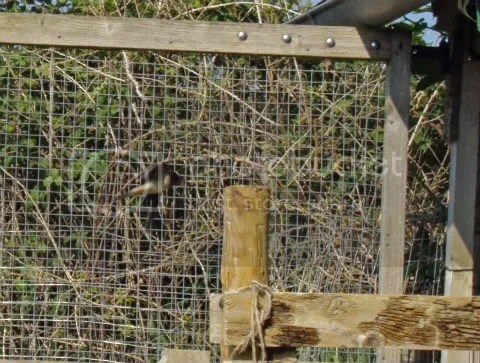 As we had a few lambing problems last spring, the petit bâtiment was in use for about three weeks and it became obvious that a pair of swallows were being seriously inconvenienced by the mesh door being closed during the day. Their swearing each time we were up there made their displeasure clear! They also dive-bombed us and it took real courage not to duck when they flew at us. We were disappointed too – we’d have loved them to have nested – but we nearly lost one of the ewes after lambing and it took time to get her right again and her needs came first. Happily, Espresso and the lamb – Sam, short for Samantha because it was election time! pulled through and returned to full health. As soon as Espresso and Sam joined the others, the swallows were in and frantically making up for lost time. It took us a while to figure out where they were building their nest. The petit bâtiment has electricity so we can see what we’re doing when there are animal problems at night and there’s a beam-mounted, commercial light fitting. And that’s where they chose to build their nest. It was an amazing structure – look at the way the mud has been pasted on to construct the main part of the nest – and we guess the straw was harvested from the floor of the stable. All of this mud was collected by the birds themselves and then built up over the light fitting till it was of a size to accommodate the chicks. Simply remarkable. We checked the nest every few days and eventually heard frantic cheeping each time we went in. The chicks heard us moving and assumed that we were ma or pa swallow arriving with food. The stable is the ideal place to shear the sheep so – annoying though it was for the birds – over one weekend they had to put up with us sitting outside with a pair of clippers and wildly wriggling sheep while they got a wool-cut. I couldn’t get a good photo of the birds dive-bombing us to dissuade us from loitering there but this is an attempt to show these little birds flying in and out. We were thrilled with the way the chicks grew and, eventually, fledged. Presumably they were too. There were four and just as they looked as if they were going to overspill from the nest we spotted them flying around the garden with their parents. 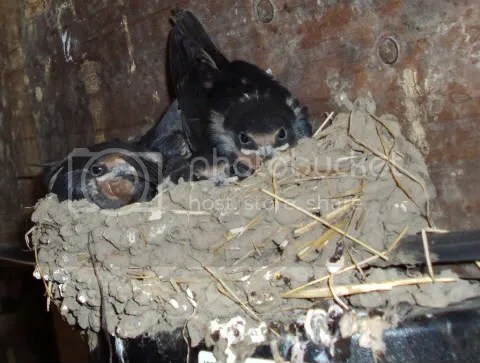 Interestingly, they all returned to the stable at night for a few weeks until – to our amazement and concern – a second clutch of eggs were laid and another four swallows hatched successfully. We were concerned because we couldn’t see that they would fledge and achieve sufficient body weight before embarking on their migration to Africa. It was a warm autumn so migration started late and we hoped for the best… and practically, there was nothing we could do. It will be interesting to see how many return this summer. We plan to erect another shelf higher up in the building to, we hope, encourage some of this year’s birds to nest.